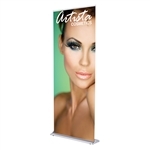 Kit Includes: Single sided graphic, silver base, support pole, clamp bar and travel bag. Includes: Banner graphic, anodized silver base, a 3-part bungee corded tension pole and padded carry bag. 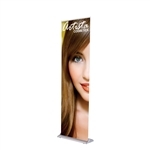 Includes: 31.5"w Banner graphic, anodized silver or black base, a 3-part bungee corded tension pole and padded carry bag.